John Lehman Horst, Sr.: editor; born 9 November 1889, the third son of Lydia Lehman (12 August 1859 - 3 February 1923) and Michael Horst (5 January 1856 - 6 November 1934). On 24 February 1935 Horst married Emma Martin Zimmerman (5 March 1894 - 25 February 1985) and they had two children, John L. Horst, Jr. and Rachel Horst Witmer. John died on 24 November 1964 and is buried in Weavers Mennonite Church Cemetery, Harrisonburg, Virginia. John grew up on a farm outside of Chambersburg, Pennsylvania and attended a one-room school through the 8th grade. As a young adult he worked in various mechanical jobs at the railroad terminal in Chambersburg. Largely self educated, he received a diploma from the Correspondence Department at Pennsylvania State College and took a 12-week summer course at the Bible Institute of Los Angeles (Biola Institute) in 1924. Always an avid reader, he developed an interest in writing articles. One of these, "Observations of a Novice at General Conference," reported on the 1919 biennial meeting held in Assembly Park, Harrisonburg, Virginia. Horst submitted it to the Gospel Herald (25 September 1919), and it caught the attention of Editor Daniel Kauffman. Horst was invited and came to Scottdale, Pennsylvania in 1920 to work at the Mennonite Publishing House. He began as a linotype operator and moved through the ranks, becoming associate editor of the weekly Gospel Herald (1922 to 1953) and editor of the Christian Monitor: A Monthly Magazine for the Home from 1930 until it merged into Christian Living in 1953. In 1929 he was ordained by lot as pastor of the Scottdale Mennonite Church, an unpaid position at that time. The publishing house and church were in adjacent blocks, which made it convenient to share responsibilities. 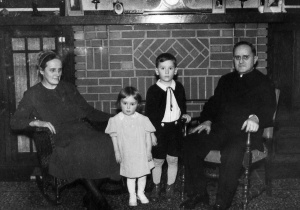 Horst family at Christmas time, 1942, in their home on Homestead Avenue, Scottdale. Emma Z., Rachel, John, Jr., John L. Horst, Sr. In 1935 Horst married Emma Martin Zimmerman, who was then matron at Eastern Mennonite School (EMS, now Eastern Mennonite University). The wedding took place in the EMS Administration Building Chapel and was the first church wedding held in the Virginia Mennonite Conference. Being a talented editor and beloved pastor led to additional responsibilities. Horst served on the founding board of the Laurelville Mennonite Church Camp when it opened in 1943. He was ordained bishop (1946) in the Southwest Pennsylvania Mennonite Conference. He later served as moderator from 1952 to 1956. The name was changed to Allegheny Mennonite Conference with a new constitution in 1954, during his tenure. In the fall of 1945. he traveled to war-torn Europe as a representative of the Mennonite Relief Committee, where he worked with Peter Dyck. He later traveled to the 1957 Mennonite World Conference held in Karlsruhe, Germany as the representative of Allegheny Mennonite Conference. He traveled widely in the Mennonite Church and was known for his quiet demeanor and a talent for resolving congregational conflicts. After retiring from the Mennonite Publishing House, John and Emma Horst moved to Harrisonburg, Virginia in 1957. He spent his remaining years managing the Home Bible Studies curriculum, a division of Mennonite Broadcasts, Inc. (now MennoMedia). He found it stimulating to converse with speakers B. Charles Hostetter and David Augsburger. The Mennonite Publishing House in Scottdale was an enriching place to work from 1920 to 1957. Church leaders such as Daniel Kauffman, A. J. Metzler, and Paul Erb were just a few doors away, and many others traveled to Scottdale for significant meetings. Horst, John L., Sr. "After Forty-Five Years: Hail and Farewell." Christian Monitor (December 1953): 361-364. Shetler, Sanford G. Two Centuries of Struggle and Growth 1763-1963: A History of Allegheny Mennonite Conference. Scottdale, Pa.: Published by Allegheny Mennonite Conference / distributed by Herald Press, Scottdale, PA, 1963: 418. Mennonite Easter hymn "In the Garden"
Text by John L. Horst, Sr.; Music by Henry D. Weaver, Sr.
Horst, John L. "Horst, John L., Sr. (1889-1964)." Global Anabaptist Mennonite Encyclopedia Online. April 2012. Web. 20 Apr 2019. http://gameo.org/index.php?title=Horst,_John_L.,_Sr._(1889-1964)&oldid=143295. Horst, John L. (April 2012). Horst, John L., Sr. (1889-1964). Global Anabaptist Mennonite Encyclopedia Online. Retrieved 20 April 2019, from http://gameo.org/index.php?title=Horst,_John_L.,_Sr._(1889-1964)&oldid=143295.